Passover (Pesach in Hebrew) is a major Jewish spring festival, celebrating freedom and family as we remember the Exodus from Egypt more than 3,000 years ago. The main observances of this holiday center around a special home service called the seder (meaning "order"), which includes a festive meal; the prohibition on eating chametz (food made with leavened grains, including wheat, barley, rye, oats, and spelt); and the eating of matzah (an unleavened bread made specially for Passover). On the 15th day of Nisan in the Hebrew calendar, Jews gather with family and friends in the evening to read from a book called the Haggadah, meaning "telling," which contains the order of prayers, rituals, readings, and songs for the Passover seder. The Haggadah helps us retell the events of the Exodus, so that each generation may learn and remember this story that is so central to Jewish life and history. Passover is celebrated for either seven or eight days, depending on family and communal custom. In Israel and for most Reform Jews around the world, Pesach is seven days, but for many other Jews, it is eight days. Is Passover 7 or 8 Days? The seder with its story telling, number significance, role playing and repetition is perfect for preschoolers. Is This Kosher for Passover? This recipe is so old (from my mother) that I can’t bring myself to change the first line that calls for a rotary beater—the kind you crank with your hand while the beaters go around. 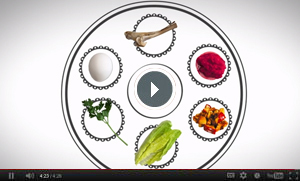 Learn about the parts of the Passover seder plate. Ready or not, Passover will be here soon! Here are seven resources from ReformJudaism.org and elsewhere in the Jewish world you can use to enrich your celebration of the Festival of Freedom. Parenting at Passover: How Do We Share this Story with Our Kids? Passover is rich in social justice themes. Here are a few ways to incorporate social action themes into your holiday observance. This directory contains the name, location and phone number of congregations associated with the Union for Reform Judaism, and a link to the congregation’s Web site.